Sand production in oil and gas wells is a serious issue for oil and gas producers. The challenge is not merely to avoid sand production, but also to increase commercial well productivity, as even small quantities of particles in the well flow can cause significant damage. As an operator you are interested in maximum production and profit from your wells, no matter what technology you use. Operators all over the world have made ClampOn their preferred supplier of sand monitoring systems, due to the patented technology that turns their wells into profit generators. The ClampOn DSP Subsea Particle Monitor incorporates a new filtering technique that makes the sand detector an extremely useful tool for analyzing the true nature of sand production, helping to control it and finally, increasing the profit from the well! This filtering technique is the result of integrating our experience of thousands of wells, analyzing data, and using the results to enhance the technology used in our ClampOn DSP Subsea Particle Monitor. The enormous capacity of the DSP sensor (the only one on the market) makes it possible to scan through a frequency range of 1 MHz 128 times per second. This illustrates the capacity of our technology and of the filtering technique that is at the core of acquiring and processing sand data. 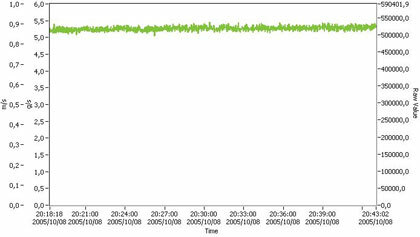 The signal from the sensor experienced on a high flow rate – high pressure gas well using a traditional/alternative sensor without DSP filtering technology. 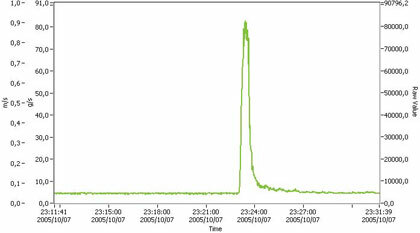 Sensor signal experienced on the same well, now with the new ClampOn DSP filter. This shows how the sensor has completely removed the flow noise, allowing the operator to monitor the true nature of the sand being produced.